Summer is here filled with warm weather, delicious berries, and young fledglings hopping on the ground. For many species of birds, this is a totally normal and natural stage of growth and development. There is no need to panic! Crows are the classic example of birds that show this behavior. In fact, almost all crow fledglings spend a week or two on the ground while they learn to fly and forage for themselves. Most fully-feathered birds hopping around on the ground are doing well and just need a bit of time and space to practice the art of flight. You can help them out by keeping pets (both dogs and cats) on-leash and away from the grounded chicks. On the other hand, if a bird has a visible injury, such as a broken wing, or no feathers, there are lots of resources available for you. 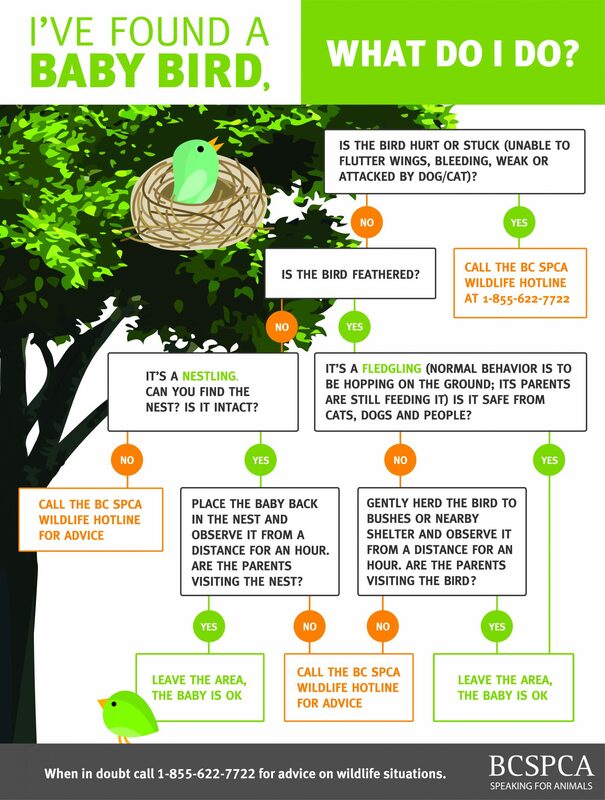 Call the BCSPCA Wildlife Hotline at 855-622-7722 or Wildlife Rescue Association at 604-526-7275. Both organizations have expert staff to help you assess the bird, its situation, and provide the best advice on what to do next.